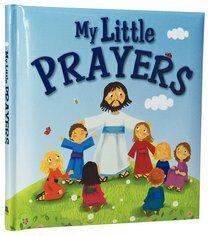 Brightly illustrated by Amanda Enright, My Little Prayers is the natural companion title to the popular My Little Bible. With delightful illustrations and a wide selection of simple prayers that are easy to learn and use every day. Karen Williamson worked as a London primary school teacher and publisher's editor before launching a successful career as full-time writer. With three children of her own, she specializes in Bible stories for young readers. Amanda Enright trained in London at Camberwell College of Art, the Royal College of Art and St Martin's College of Art, winning a prize for drawing and a Special Student Award at the Annecy film festival. Amanda is inspired by Matisse and Picasso, and by beautiful old and new children's books, vintage fabrics and toys. Customer Reviews For "My Little Prayers"
This is a beautiful little book of prayers with gorgeous illustrations. I gave my niece this book and she was so happy. It is a cute little book and the prayers are short and useful for children to use everyday. This makes a great gift for children's birthdays, Christmas, any occasion.